High Pressure Multioutlet Grease Pump that we offer comes with individual output adjustment. This pump can be used for covering lubrication points. We are named among the renowned Manufacturers and Suppliers of Grease Pump. The manufacturing of our Grease Pump is done using highly advanced techniques under the strict vigilance of experts. 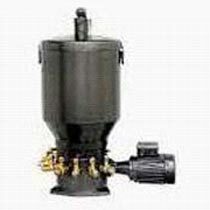 One can obtain the Grease Pump from us at a very reasonable price. Plate with tell tale rod. Medium and Large size Presses, Earthmoving Equipments, Screw Conveyers, Punching Presses, Mixing Mills, Crushers, and Turbines etc.